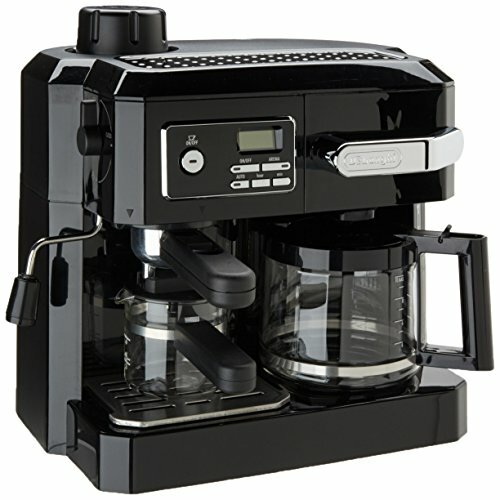 The DeLonghi BCO330T Combination Espresso and Drip Coffee Maker with Programmable Timer puts you in the driver's seat. You can't beat the spontaneity: you can brew espresso and coffee at the same time. Enjoy full flavor saturation with the patented Flavor Savor brewing system, and choose the strength of your espresso and coffee with the flavor dial. And you're just moments away from whipping up a great latte or cappuccino thanks to the swivel jet frother. Another adjustment you can make relates to the steam emission, which you can tailor for espresso or cappuccino beverages. With a programmable digital timer, the machine can coordinate with your daily schedule so that it's ready to serve you when you need coffee most, and it turns itself off for safety and efficiency when you'll be away. The gold-tone permanent filter never needs to be replaced. Have up to 10 cups of coffee ready to serve with the large capacity carafe. The water tank slides out of the machine for convenient filling and cleaning, and a water filtration system removes chemicals and dissolved solids that could mess with the flavor of your coffee. The drip interrupt feature shuts off brewing when the carafe is removed so that you won't have to wait for the whole pot to brew before pouring a cup. This machine is also equipped to save you from the unpleasantness and health hazard of stale coffee via its LED freshness indicator lights. An additional light illuminates every 15 minutes for the first hour to let you know how long the coffee has been standing. About De'Longhi USA Founded over a century ago when the De'Longhi family opened a workshop in Treviso, Italy the De'Longhi brand set the standard for handcrafted quality and expert craftsmanship. Three generations later, the people at De'Longhi believe design is timeless, and strive to find beauty in everyday objects to bring style to your home. Expert manufacturing is also high on their priorities.